Author: Klaus Gockel. With contributions by: Wilfried Neusel, Irene Nöh. Series edited by: Archiv und Museumsstiftung der VEM, Wuppertal. 14 pp. Roman, 289 pp. The present volume represents the ninth edition of the series Mission – Past and Present, in which Klaus Gockel portrays Martha-Elisabeth and Rudolf Weßler as well as Sister Ursula Pönnighaus. 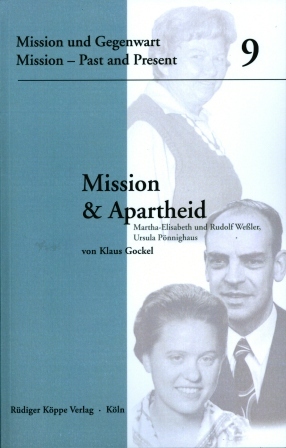 Gockel draws their life and work during the time after World War II in what was then Southwest Africa, a time they were in service of the Rhenish Missionary Society (RMG), the predecessor of the United Evangelical Mission (VEM), and had to deal with white racism in the form of Apartheid. In addition, two elaborate contributions by each Wilfried Neusel and Irene Nöh are included. The documents of the archives of the VEM written by and about Pönninghaus and the Weßlers are taken as a basis for the study. Similar to his previous two volumes, the author again cited the available source material completely or at least in extracts. At the end of the book the reader finds the original primary texts. For Klaus Gockel, racism is a universal problem of mankind which cannot be abol­ished through research and education, but these can contribute to the analysis of processes and structures of racism and the resistance against it as well as to the exploration of its background and underlying conditions. In this way, the possibility to recognise and fight present and future racism evolves.